Mushrooms are known for its healthy nutrients and when used right in cooking can enhance the flavor of many different dishes. You can find mushrooms as toppings in hamburgers, steaks and pizza. Or mushrooms are eaten raw or added to salads, soups, casseroles, rice dishes, stir-fry and scrambled eggs. Mushrooms supply the diet with vegetable proteins, vitamins, amino acids, minerals, fiber, iron plus they are low in calories. Nutritionally, mushrooms contain important vitamins like vitamin D and B vitamins and minerals like potassium, phosphorus, magnesium, selenium, copper and zinc. These vitamins and minerals play an important role to boost immune system and to keep your body healthy. A number of edible mushrooms are available and easy to buy. 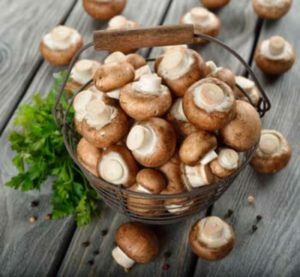 The white button mushroom is also called a table mushroom, is small in size, all parts are edible and commonly used in salads, meat dishes, soups, or pastas. They have mild and very unique flavor. At grocery stores, you can find it in freshly packaged, dried or canned form. It is a natural source of vitamin D. Also, it is a good source of antioxidants. also known as portabella. On maturation, Portobello mushrooms take a dark brown color. Due to their meaty texture, Portobello mushrooms are frequently used as a meat substitute by vegans or vegetarians in sandwiches and burgers. They are rich in selenium which is an antioxidant which helps reduce the risk of certain diseases. Shiitake Mushrooms are very popular in many Asian dishes as they provide spongy meaty texture and a woodsy taste to it. It is a good source of anti-oxidants like vitamin A, C, D and E, selenium and uric acid. Also, it has immune boosting effect in human body. It is a common edible mushroom which is tan and ivory in color. Oyster Mushrooms are broad and the cap has the oyster shape. The Oyster mushroom contains the statin for example lovastatin which help to reduce the cholesterol level in the body. Also, it helps to decrease the glucose level in diabetic patients. Porcini Mushrooms are costlier than others and usually purchased dried. Porcini Mushrooms have also a distinct flavor, a woodsy taste and are used in preparation of variety of soups, stews and casseroles. A 3 oz serving is low in calories, contains no fat and no cholesterol. Contains about 2 grams of fiber and 3 grams of protein for this serving and provides vitamins and minerals like A and C, calcium, potassium and iron.